The game's in the refrigerator: the door's closed, the light's out, the eggs are cooling, the butter's getting hard, and the jello's jiggling! Welcome to my Los Angeles Lakers page. You might ask, "is this just another Laker page on the net?" Well, this page is different in that it doesn't try to cover everything about the Lakers...too many other pages do that already. The main purpose of this page is to provide Laker fans with a few dazzling clips and a sizable high-quality picture gallery along with a useful list of Laker links. "Where do you get your clips/pictures?" I get both of these from various sources on the net. It's usually a tedious and boring job to try to find quality clips/pictures yourself. That is why I make it easy for all Laker fans around the world by compiling them at this site. Enjoy!!! 2/26/99 Rodman finally signs a one-year contract with the Lakers. 6/20/98 Nick Van Exel traded to Denver for Tony Battie and draft pick Tyronn Lue. Now all I hear is the media questioning Van Exel and his bad-boy image just because of a few arguments with Harris. I'm not sure how this trade will turn out but the bad side is losing a All-Star caliber point guard that can and did hit big shots when the Lakers needed them. No one seems to remember earlier in Van Exel's career (right after Magic retired) when he ran the team and WAS the offense. Then after some additions and changes, he adapted to fit the team...he was a good part of the Lakers and will be missed. The "good" side is that Van Exel only had one year left on his contract (Lakers can't afford to give out too much more), and that his somewhat chronic knee injuries could have really taken him out of how he wanted to play. 6/1/98 Well with a 61-21 regular season record (one win behind the league's best), the Lakers fell flat to Utah for the second straight year, losing 0-4 in the western conference finals. And again like last year, Utah lost to the Bulls. Have to say though, if this is it for Mike, there couldn't have been a better finish. 2/11/98 If you watched or heard about the All-Star game, you'll know that the West got blown out. 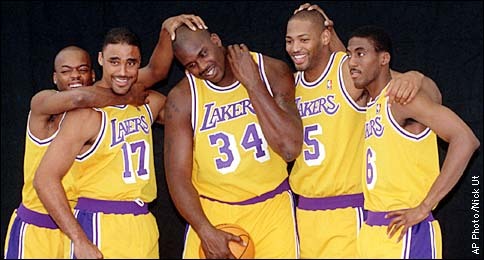 The Lakers, as a whole, did pretty well though. Take a look at the stats here. Take a look at the 4 Lakers in action here. Check out my best collection of Laker clips! !